Novels that inspire horror movies are easy to find, but short stories might need more detective work. They might only be found in old anthologies or even magazines. So when I saw these two paperbacks, I pounced on them! The Ghouls: Books One and Two were edited by Peter Haining, with nine short stories in each, every one used as source material for a horror film. I bought these paperbacks just after they were published in 1974 (previously available as a single hardback). All I know is that they were sold in the UK and US, and reprinted in the UK in 1994. Such a brilliant theme for a collection, I'm surprised that there haven't been many more. As a tribute to a great idea, here's an over-ambitiously long article that took months to put together - I've read all the stories again and watched as many of the movies they inspired as was possible. While I'd disagree that all the films are 'horror classics', I've been led to some great films that I'd not seen before. Haining's introduction, as well as the foreword and afterword from genre giants, Vincent Price and Christopher Lee respectively, contain insightful notes on the genre. 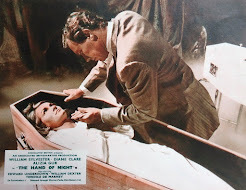 Haining makes a case for a place in the world for horror films and novels, at a time when gory or scary films were still widely being dismissed by critics and scholars alike. He originally chose these tales to illustrate how fiction has inspired horror films through the years, from the very first decade of cinema. His introductions to each story reminded me of the state of the genre back then. For instance he remarks that Freaks "was the most horrific film ever made" and that The Magician was a "missing" film. Thankfully, far more horrific films have been made since 1974, and The Magician is no longer lost. In fact, it's just hit DVD. Based on The Devil In A Nunnery, a Medieval tale retold by Francis Oscar Mann. This ancient story tells of the devil tricking his way into a convent by posing as a troubadour. As he sings to the nuns, they start behaving completely out of character. There's a sense that the author is hinting about a multitude of sins without getting into trouble for naming them explicitly. 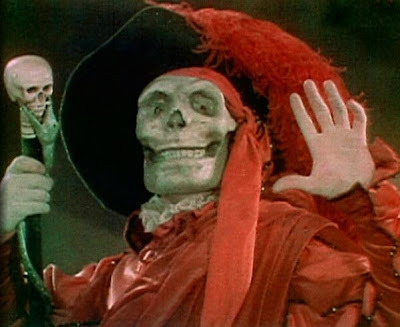 This premise became one of the short (just three minutes long) frantic films created by French pioneer and genius Georges Méliès in the first few years of cinema. Well ahead of Hollywood tradition, Méliès completely rewrote the story by having the devil pose as an old priest - a far more wicked disguise. While the story depends on wordplay, this short silent film visually riffs on the mayhem that a pantomime demon could wreak in a church - summoning little devils and monstrous animals. Mischievous fun rather than anything too blasphemous, the film has a single camera angle but a constantly evolving set powered by trap doors, puffs of smoke and his trademark in-camera editing. Hardly a horror classic, but a gracious nod to cinema's first studio of the fantastic. Based on The System Of Dr. Tarr and Professor Fether (1845) by Edgar Allan Poe. Who else would early film-makers turn to for bizarre and scary ideas? This lesser-known tale from Poe is more of a comic twist than a descent into horror, though the premise has often been used in far more ghastly 'madhouse' movies, such as Ghost Story and Asylum. The slim short story would have been ideal as a short film, which lasted only 15 minutes. Incidentally, it was directed by Maurice Tourneur, father of Cat People and Night of the Demon director, Jacques. The story was again officially adapted in Mexico as The Mansion of Madness (1973), directed by Juan López Moctezuma (Alucarda). Based on Feathertop (1852) by Nathaniel Hawthorne. From the author of The Scarlet Letter, is this dark fairy-tale of a New England witch who brings her scarecrow to life, looking like a human being. She then fixes on the idea that her scarecrow should find love, (a contrivance to set up this story of fateful romance). While the premise of a living scarecrow is more usually horror nowadays, this tale (and The Wizard of Oz) present him as a friendly fantasy, despite the use of witchcraft. I couldn't find any silent version of this, I'm not even sure if the early films (also 1912, 1916) still exist. 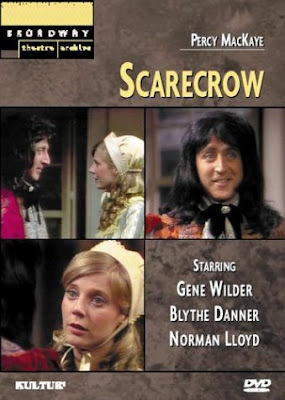 A Broadway stage adaption, filmed for TV in 1972, had very poor reviews, despite having Gene Wilder as Feathertop himself. Based on the 1909 novel by Gaston Leroux. At this point Haining cheats a little, presenting a specially abridged version of Gaston Leroux' book. But this is a good way to enjoy the story and avoid the overlong sub-plots of opera house politics and romantic rivalry. This condensed version seems to have been trimmed to give us the passages that were translated to the screen for Lon Chaney's brilliant work. Conversely, this silent 1925 adaption (slightly reworked for sound in 1929) is a quite faithful adaption of events in the novel, apart from the completely revamped ending. I enjoy this movie version the most with its focus on The Phantom as the central character and the extensive use of gothic atmosphere in, well, everything - the cavernous sets and production design, the lighting, even the angry mob with torches. It's a horror epic. 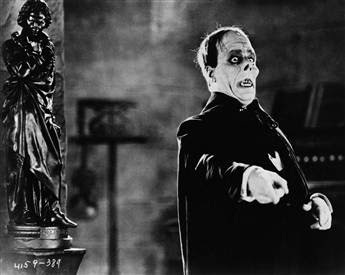 Lon Chaney's Phantom is the most famous of his extreme make-ups and the movie is required viewing as America's first landmark horror film. The restorations available on DVD include the early two-strip Technicolor sequences that treat us to The Phantom in eerie colour. 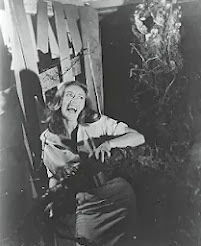 Leroux' story is now well known, though most subsequent adaptions diminish the severity of the horror content compared to the first, silent adaption. 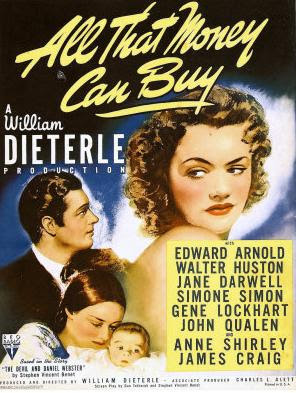 Based on the 1908 novel by Somerset Maugham. Haining cheats again by offering just an extract from a novel. He chose the passage describing the hypnotised heroine's dream of Hell, which became the film's delirious highlight. Maugham is a celebrated author in Britain and many of his stories have been adapted as movies through the years (most recently The Painted Veil with Naomi Watts and Edward Norton) but at their most popular in the 1940s. 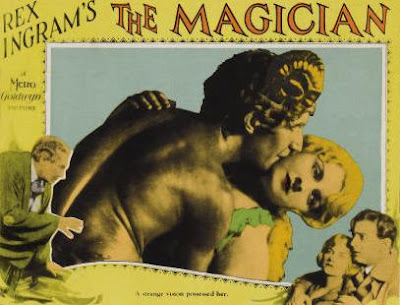 Most of his novels were dramas, but The Magician was a dark fantasy focussed on a caricature of occultist Aleister Crowley, reimagined as the bragging Oliver Haddo, who might actually have discovered the mastery of dark powers. The silent adaption is faithful to the story and characterisations of the novel, right down to the French locations, though it adds a dramatic subplot to open the film. 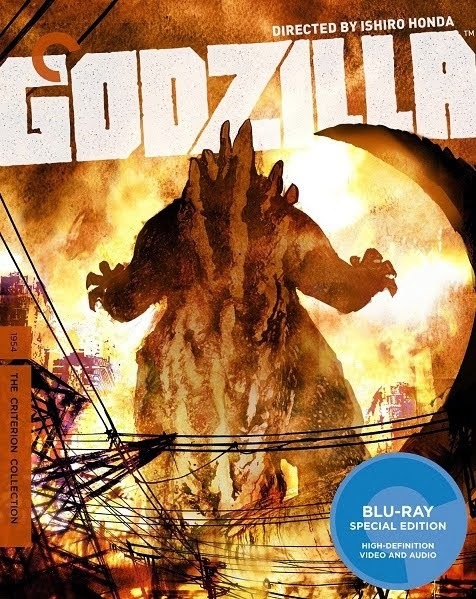 Warner Archive have just released this influential silent horror. 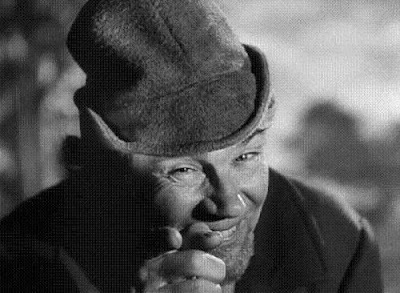 I was excited to see Germany's horror star Paul Wegener (The Golem, Alraune, Svengali, The Student of Prague) in his only American film. This was easy casting to arrange because director Rex Ingram shot the film entirely in France, boasting many actual locations. It was obviously easy for a German actor to appear in a Hollywood film when they were silent. At the time, any news of Crowley was usually scandalous (he was still alive), possibly enough to damage the film's chances - it didn't do well. But Ingram implies much more than he shows, and also adds tongue-in-cheek humour to the melodrama. 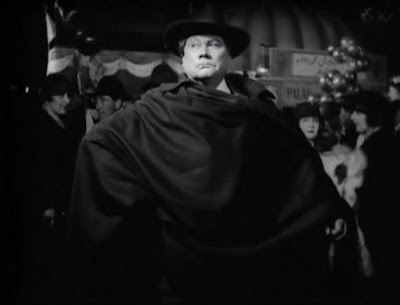 There's a wonderful moment when Wegener exaggerates his character's exit with a superbly haughty throw of his cloak over the shoulder. A hunchback dwarf in a mountain-top tower housing a huge laboratory is intended as a ridiculous egocentric overly-dramatic setting. It manages to satirise Frankenstein five years before it was made. All that's missing is the flashy flashing electrical equipment. The scene in Hell is more serious and more sexual, a visually different depiction to Hollywood's usual reliance on Dante. As well as pre-dating Frankenstein, suffering censorship problems with the subject of satanism, the story also veers into the world of Svengali, who Wegener portrayed the following year. Much of Haddo's success is due to his powers of hypnotism. Based on Spurs (1923) by Tod Robbins. Director Tod Browning chose this story to continue his love affair with circus life and trump the horror of Dracula (1931) more thoroughly than the studio actually wanted. The little person of the story is far from the helpless and sympathetic character of the film. He's a suspicious dwarf who has the upper hand because of a huge, fierce dog under his command. Author Tod Robbins earlier wrote The Unholy Three (in 1917) which Tod Browning had adapted as a silent film (in 1925) starring Lon Chaney. It was remade as a talkie (in 1930) and proved to be Chaney's last film. 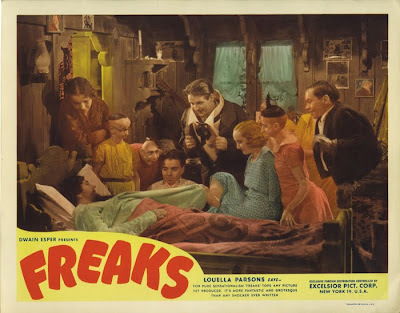 Despite the parade of real-life physical abnormality in TV documentaries, this 1933 film still has the power to unsettle and shock, mainly due to the extreme nature of the circus people's disabilities and the lack of medical and public understanding they must have endured. 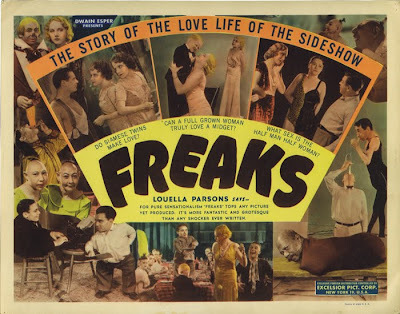 While Browning had a circus background to draw on for realism and inspiration, his portrayal of the 'freaks' is two-faced, inspiring much criticism and censorship through the decades. Though they are sympathetically portrayed through much of the film, Browning switches to using them to prey on our fears, as scary monsters in the nightmarish climax. 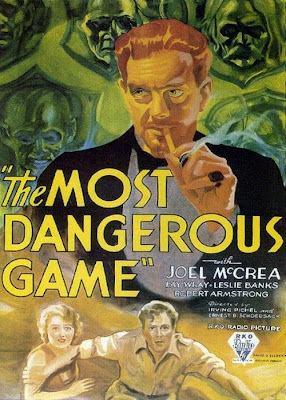 Based on The Most Dangerous Game (1924) by Richard Connell. A classic and often reused story - a hunter who likes to hunt... humans. A simple short story that quickly unfolds as a shipwreck survivor learns that his ship was wrecked deliberately. Anyone left alive provides quarry for a mad huntsman living in an island fortress, from which there's no escape. The first and best movie adaption also re-used the sets of King Kong (1933), with many of the same cast and crew (while the extensive animation was being finished). 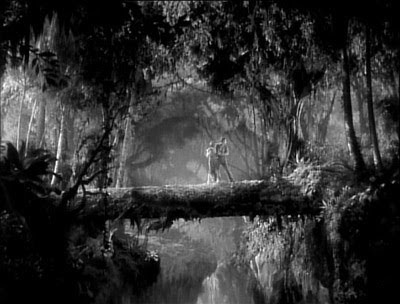 It's fun to see Fay Wray and Robert Armstrong together again, with Fay running across Skull Island's famous log bridge, but being chased by Count Zaroff and his pack of hell hounds. It's my favourite of the many versions because it's the purest telling of the tale - there are no subplots or mucking about - we're on the island the whole time. The film is almost too short, barely over an hour. I also like this as a flipside of Kong's world. As if they got rid of the giant gorilla and made a prototype Battle Royale instead. For its age, it's still exciting and even brutal, though most of the explicit violence was toned down (cracking of bones removed from the soundtrack, torture and mutilation cut completely out). This is the greatest character that Leslie Banks (Went The Day Well?) 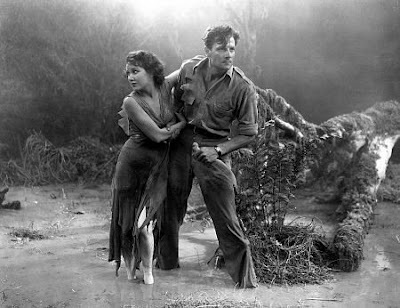 played -the insane Zaroff, with Joel McCrea (the star of Hitchcock's Foreign Correspondent) and Fay Wray looking bedraggled, but gorgeous, even after dragging themselves through a swamp. Based on Dracula’s Guest (1897) by Bram Stoker. This was first published in 1914, but was written in 1897 as the opening chapter of Stoker's most famous novel Dracula. It describes how Jonathan Harker encounters the weird and uncanny before he even reaches Castle Dracula. It's hard to see exactly how this became the inspiration for Dracula's Daughter, only one late scene in the film bears any relation to the story. Presumably publicity was trying to hype up as many links as possible between the first ever Dracula sequel and the literary prequel. This is a very good Universal horror, but would've been even better if it hadn't been restricted by new censorship rules for horror films. The gothic mood is constantly interrupted by bursts of comic relief, mostly provided by an unlucky policeman (silent comedy star Billy Bevan). 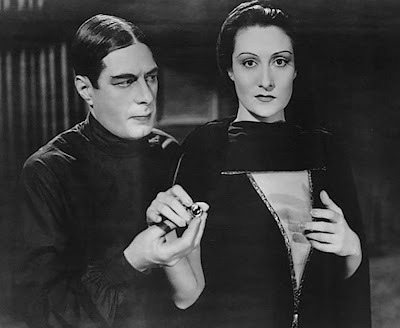 But Gloria Holden is extraordinary and ethereal and her duel of wits with the living is more effectively dramatic than the staginess of Dracula. 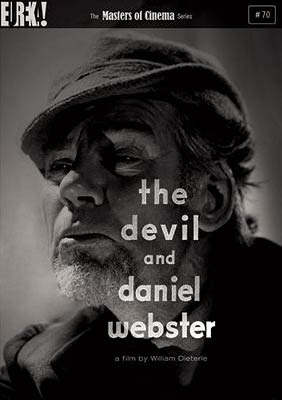 Based on The Devil And Daniel Webster (1937) by Steven Vincent Benet. This story is in itself an adaption of a tale as old as the hills. A variation of the Faust legend given an American mid-19th century setting. Whenever you get a wish, there's always a catch. The film was famously referenced in The Simpsons' very first Treehouse of Horror, which is a good taster for the finale - a courtroom drama staged by the Devil himself. A young farmer, Jabez Stone, struggling to raise a family, curses his luck and swears that he'd do anything to improve his life. Out of nowhere, a stranger helps change his fortunes for the next seven years, in return for a small consideration, his soul. It helps if you know a little early American history (gulp), in particular Daniel Webster. Here he's a popular politician dedicated to helping the farmers. Luckily for Jabez Stone, he's also a great lawyer. In reality, Webster also ran for President no less than three times. The story decribes many of Webster's achievements without detailing them. So all the dialogue for the famous legal scene had to be written from scratch. The lighting in this film is extraordinary. It noticeably and literally adds shades to the performances, and transforms simple sets into frightening tableaux. The Devil, though he's never actually named, arrives through a barn door - doesn't sound like much - but the lighting makes it startling. It reminded me of the appearance of a demon, the highlight of the bonkers Esperanto Incubus (1966). With Bernard Herrmann composing the music, sharp black and white cinematography, and ironic dialogue unafraid to highlight inhumanity and injustice, the film looks like a pilot movie for The Twilight Zone, but fourteen years early. As Jabez Stone gets closer to his fate, the denizens of Hell come up and meet him. These shadowy glimpses of half-seen apparitions are still scary. Until I'd re-read The Ghouls for this article, I'd barely heard of this film, though I now realise its credentials are close to legendary, being produced at RKO Studios the same year as Citizen Kane, sharing some of the same production crew, like the composer (Herrmann) and editor (Robert Wise). The production design is ambitious and successful, portraying very similar situations to Days of Heaven but entirely on a soundstage. Director William Dieterle later directed the great version of The Hunchback of Notre Dame in 1939. A supernatural fantasy hinting at the horrors of damnation, this is a superb movie. 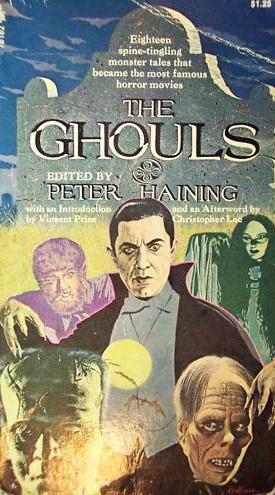 The Ghouls was first published as a single hardcover by W. H. Allen in 1971, then as two paperbacks from Orbit in 1974. I've always thought that the cover needed a stronger hint that these stories were connected to films - perhaps using photographs. I've changed my mind after seeing the US paperback edition (above). Another superb post! I have a great affection for Peter Haining's anthology work through the 70s, but somehow this title eluded me. I love weird fiction and horror cinema, so shame on me.